SET OF EIGHT crystal holiday gourmet coffee mugs, $15, Barracuda 63-inch pool worm/cleaner, $100. 941-737-9173. CANTON HOME THEATER speaker system. Four cubed surround sound speakers, one center channel speaker and subwoofer, $1,850, new, now, $475. FUTON: LIGHT COLORED, hardwood, excellent, $75, wood coffee table, $90, screen doors, complete, $25. 941-778-3920. FOR SALE: LATERAL file cabinets: 2 HON 2-drawer black and 4 attractive 2-drawer wood files. One legal and one letter-size regular 2 drawer files. Various office supplies. Also selling antique wood office chairs, Haitian art, collectible art, some framed. Many local artists. Home decor. 5404 Marina Drive, Holmes Beach. EARLY CLASSIFIED DEADLINE! The deadline for classified ads for the Dec. 26 edition is 5 p.m. Thursday, Dec. 20. The Islander office will be closed Monday and Tuesday, Dec. 24-25. YARD SALE: 8 a.m.-1 p.m. Saturday, Dec. 22. Some Christmas items, antiques chest, this and that. 512 69th St., Homes Beach. WHERE’S WOODY ART & Yard Sale at The Islander, 9 a.m.-2 p.m. Saturday, Dec. 22. Local artists offer bargains. If we’re lucky, namesake Woody Candish will appear! 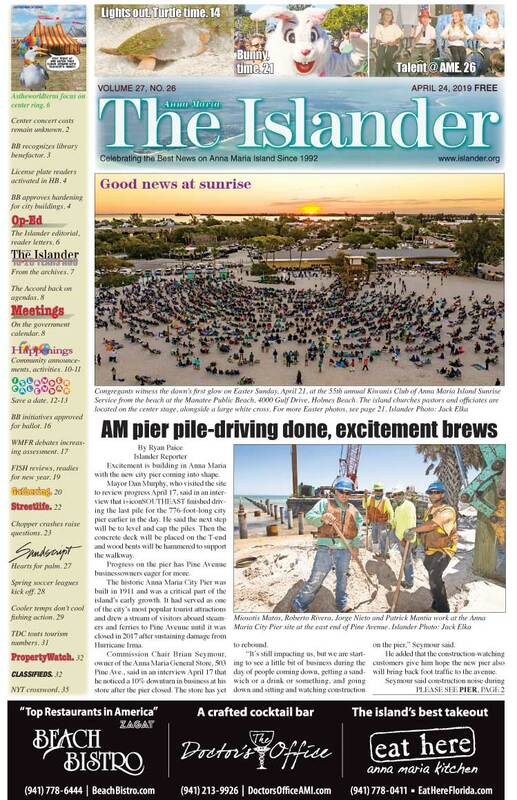 The Islander will host its annual yard sale. Island Shopping Center, 5404 Marina Drive, Holmes Beach. LOST: BOX OF very large canvas prints, corner of Marina Drive and Gulf Drive, Holmes Beach. Lost Monday morning, Nov. 19. Jay, 941-243-4303. WELL-MANNERED RESCUED dogs are looking for great new homes or fosters. Larger dogs. Please, call for information, 941-896-6701. SEWING AND ALTERATIONS for clothing, bridal wear, home decor. Tuesdays at Timeless Treasures 401 Pine Ave., Anna Maria. ANNUAL RENTAL: 2BR/1BA cottage. Gulffront location. $1,500/month plus utilities. Call for details. Anna Maria Realty Inc. 941-778-2259. amrealty@verizon.net. PERICO ISLAND: 3BR/3BA private pool, communal pool, gym and tennis. Available December and January. 941-795-3778. www.pericoholidayvilla.co.uk. RENT: $2,700/MONTH. Bradenton/Anna Maria Island area. 3BR/2BA home located on deep-water canal. This home has lovely, unique features, open space, in-ground pool, boat dock/lift, patio room, two-car garage and so many other amenities, why wait? Call us today for the special on the monthly rent. Close to many restaurants, shops and the beaches … you don’t want to miss out on this! 614-486-9833. WATERFRONT: M.D. FROM Norway with wife and teenage daughter are looking for a cash deal on a 3-4BR house on Anna Maria Island, in Bradenton or Lakewood Ranch. Call Helmer, Licensed Realtor, 941-592-8853.